A great adventure, where the spirit of the brave explorers and navigators of the past is still there, waiting for the daring traveler of today. If you feel like it, go for it. Take this dream-like journey that will send you as south as it goes. To the bottom of the earth! Start your voyage from Ushuaia, Patagonia ( Fin del Mundo). Get on board one of those expedition ships. Let it take you, through the Beagle Channel, to the Cape Horn (Tierra del Fuego) and across the Drake Passage to the Antarctic Peninsula. Let the icebergs surround you. Do your landings by zodiacs on unique points, little islands, like Half Moon, the volcanic Deception, Danco, Petermann, Melhior and many more. Visit research stations, like the historic Bellingshousen. Sail through narrow channels of floating ice. Explore wide bays and deserted whalers posts. Lower the anchor in desolated harbors and frozen ports, like Neco, Paradise, Neumayer, Lockroy and Lemair. 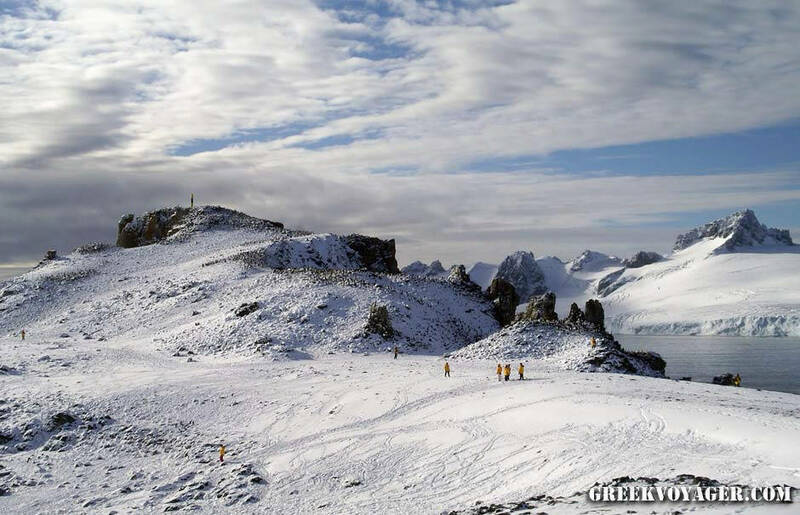 Admire pristine glaciers, stunning sceneries, spectacular locations, fantastic white views, all exposed to severe weather. Experience sudden storms of strong winds or heavy snow. Watch penguins, fur seals, whales, elephant seals, albatrosses and petrels. 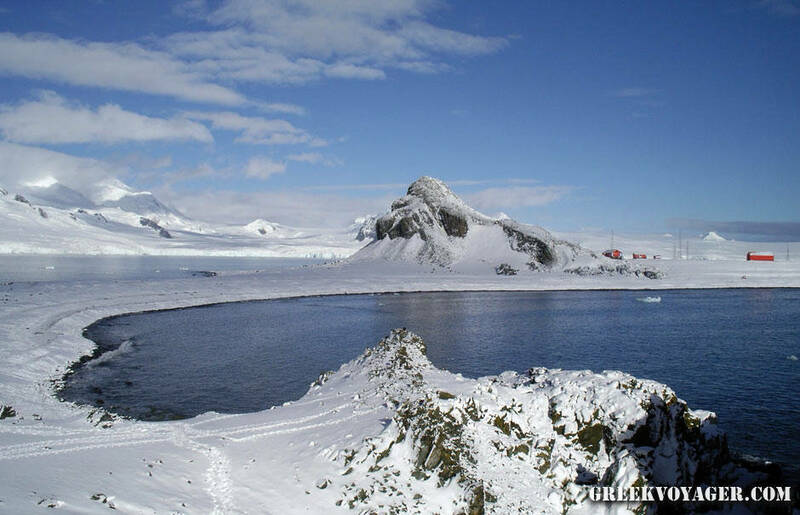 Antarctica has an area of ​​14.0 million sq km (5.4 million sq mi); almost twice the size of Australia. The coastline has a length of 17,968 km and is characterized mainly by ice formations. The continent is divided by the Transantarctic Mountains close to the neck between the Ross Sea and the Weddell Sea. The part west of the Weddell Sea and east of the Ross Sea is West Antarctica and the remainder East Antarctica; that's because roughly correspond to the western and eastern hemisphere relative to the Greenwich meridian. About 98% of the surface is covered by the Antarctic Ice Sheet; a sheet of ice with an average thickness of at least 1.6 km (1 mi). The rest 2% (280,000 sq km) is ice-free barren rock. 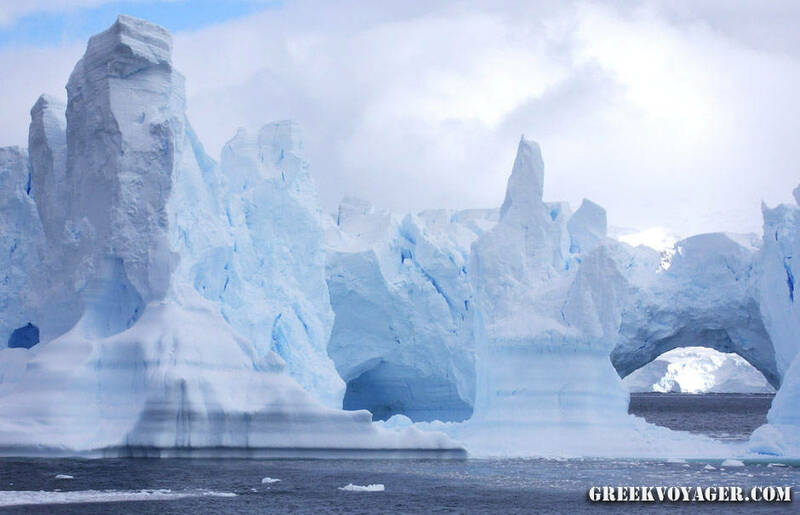 The continent has about 90% of the ice in the entire planet; this means 70% of the fresh water in the world. If all of this ice melted, sea levels would rise about 60 m.
The highest peak is Vinson Massif at a height of 4,892 m, in the Ellsworth Mountains. There are many other mountains in the continent and in the islands around. The Mount Erebus in the Ross Island is the southernmost active volcano in the world. Well-known for an enormous eruption in 1970 is another volcano on the Deception Island. In 2004 American and Canadians researchers discovered in the Antarctic Peninsula an underwater volcano which maybe active. There are also other dormant volcanoes which can be potentially active. In 2008 the British Antarctic Survey scientists announced that 2,200 ago was the eruption of a volcano under the Antarctic ice sheet, which was the biggest in the continent during the last 10,000 years. In Antarctica are over seventy lakes lying at the base of the continental ice sheet. The largest is Lake Vostok, discovered in 1996 beneath the Russian Vostok Station..
Antarctica is the coldest continent. The lowest natural temperature ever recorded on Earth was on 21 July 1983 at the Russian Vostok Station. It was −89 °C (−129 °F). Antarctica is a desert; a frozen desert! The annual precipitation is only 200 mm (8 in) along the coast and far less inland; in South Pole is less than 10 cm (4 in). The severe low temperatures vary with latitude, altitude, and distance from the ocean. Temperatures reach a minimum of −80 °C (−112 °F) to −90 °C (−130 °F) in the interior in winter and a maximum of 5 °C (41 °F) to 15 °C (59 °F) near the coast in summer. The East Antarctica is colder than West Antarctica because of the higher altitude. The weather fronts rarely reach deep into the continent; thus, the center remains cold and dry. Antarctica Peninsula, in the northwestern edge of the continent, has the most moderate climate. Antarctica is colder than its antipode in the north, the Arctic.First, because most of the continent is located at an altitude of more than 3 km from the sea level and the temperature is decreased as altitude increases. Secondly, the area of the North Pole is covered by the Arctic Ocean, of which the relative warmth is transferred through the floating ice; this does not allow the temperature to reach the extreme levels ​​which are typical for the land of Antarctica. Several countries have claimed sovereignty in certain regions of Antarctica. While some of these countries have mutually recognized each other's claims, the validity of these claims is not universally recognized. In 1959 the Antarctic Treatywas signed by 12 countries. From this year there have been no new claims. The continent is considered neutral. So far the Antarctic Treaty has been signed by 49 countries. Together with other agreements it constitutes the Antarctic Treaty System. The treaty prohibits military activities and mineral mining, nuclear explosions and nuclear waste disposal, supports scientific research and protects ecosystem of the continent. In 1998 the Protocol on Environmental Protection to the Antarctic Treaty came into force; it is also known as the Environmental Protocol or Madrid Protocol. It is the main instrument concerned with the conservation and management of biodiversity in Antarctica. It bans all mining in the continent designating it as a natural reserve devoted to peace and science. The agreement will be reviewed in 2048. The main economic activity is fishing and offshore trading of fish. Also tourist interest grows more and more. Exploring tourism has existed since 1957. 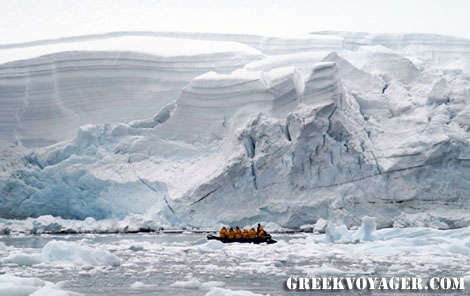 It is subject to Antarctic Treaty and Environmental Protocol; in effect is self-regulated by the International Association of Antarctica Tour Operators (IAATO). 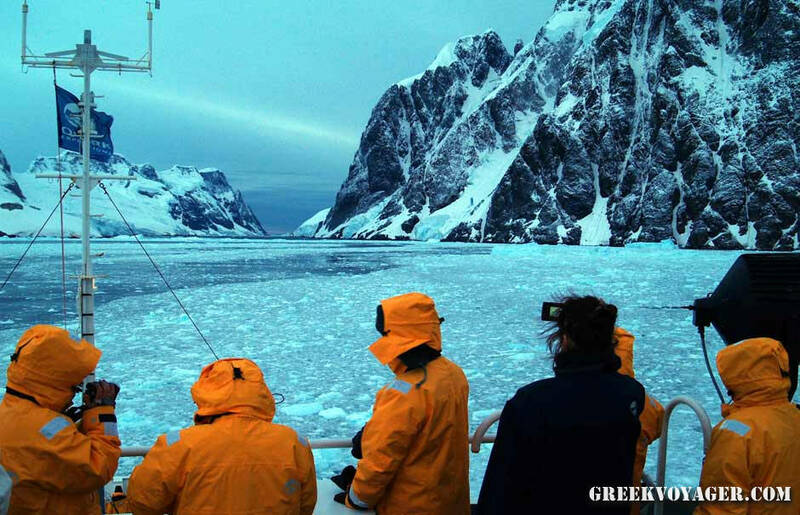 The trip takes place during austral summer ​​by small or medium ship, focusing on specific areas and islands in the Antarctic Peninsula, in the northwest corner of the continent. After some concerns about the potential effects on the environment and ecosystem of the influx of visitors and calls for stricter regulations, the members of the Antarctic Treaty by the Committee for Environmental Protection and in partnership with IAATO established guidelines by setting limits on landings and targeting areas closed or restricted to the most frequently visited sites. Several countries have permanent research stationsthroughout Antarctica. Each year scientists from twenty-eight countries conduct experiments which can not be made ​​in other parts of the world. During the summer over 4.000 people work at the research stations in the continent and nearby islands. During the winter they are about 1.000. The McMurdo Station, the largest research station in Antarctica, can host over 1,000 scientists, visitors, and tourists. The researchers are geologists, oceanographers, biologists, physicists, glaciologists, meteorologists, and astronomers. There are no permanent residents; from 1,000 to 5,000 people live throughout the year at research stations scattered across the continent. Only cold-adapted organisms survive in Antarctica; among them, many species of algae,animals (such as mites, nematodes, penguins and seals), bacteria, fungi, plants and some other species. Vegetation where it occurs is tundra type. The aurora australis (southern lights): a glow created by the solar winds full of plasma, which pass by the Earth, observed in the night sky near the South Pole. The diamond dust: a cloud at ground level composed of tiny ice crystals and generally formed in otherwise clear or nearly clear skies; so sometimes is called clear-sky precipitation. The sun dog: a frequent atmospheric optical phenomenon; it is a bright spot that appears beside the true sun. The frozen surface of Lake Vostok, the largest lake in Antarctica, has similarities with Europa,the moon of Jupiter. Some ice cores found 400 m above the water line may indicate that there is microbial life in the waters of the lake. The discovery of life in Lake Vostok would mean a lot to the possibility of life in Jupiter’s Europa. In 2008, NASA began a mission at Lake Untersee researching in its high alkalinity waters for extremophiles. The finding of such organizations could further strengthen the argument for extraterrestrial life in extremely cold, methane-rich environments. that the first to see the continent in 1820 were the members of the Russian expedition of Fabian Gottlieb von Bellingshausen and Mikhail Lazarev with the ships Vostok and Mirny.